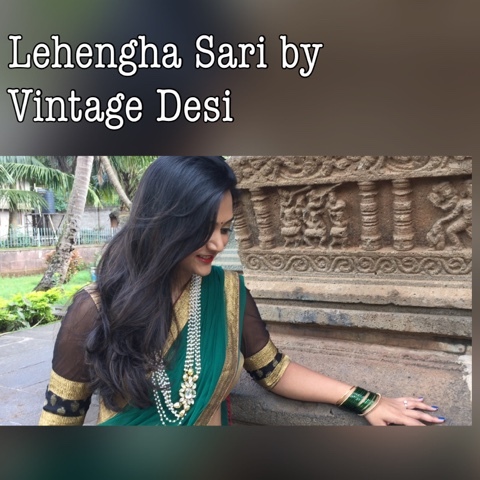 black brocade beauty from Vintage Desi. admire their necklace collection check it out here ! They have also started shipping internationally so don't worry if you are not in India. I chose this ready to wear sari /Lehengha sari because the skirt is pre stitched with pleats and only I need to pin the dupatha/pallu. So its easy to wear and looks perfectly like a regular sari with the advantage of being easy and comfortable. It looks heavy but fortunately this ready to wear sari is light in weight. The blouse sent with the sari is beautifully designed. I love the sheer sleeves with the border at the end. It has a deep back with good finishing. Overall the blouse compliments the ready to wear sari /Lehengha sari perfectly. The best part about blogging is connecting with strangers whom you have never met before. For the first time I have collaborated with 8 youtubbers to create different outfit and make up looks for Navarathri. Please check their channel links in the description box of the below video to see their amazing work. I am also very happy to share this video as its my first vlog in India and you will love the jain temple. Do let me know your thoughts. as always this Post is also Impressive and Good. looking Pretty . I love your ready-to-wear saree Ananya.. You look great girl. The jewelry is pretty too. beautiful. and the pearl neck piece is lovely! Gorgeous . Reminds me of '' Langa voni '' of telugu people.